Mobile video chat provider Tango has hit 4 million users on Android (s goog) and iPhone (s aapl) after launching two months ago at our Mobilize conference, and will now take its act to the iPod Touch. The expansion to the popular iPod Touch, which received a front-facing camera in September, should continue Tango’s rapid growth and shows the service is moving quickly to other devices and platforms. Mobile video chatting still gets approached with some skepticism from people who aren’t sure they need to face-to-face video calls. But with Apple pushing Facetime on a bunch of commercials, it’s helping the entire mobile video calling sector grow. Tango is a great example and some new company statistics show how much video calling is getting embraced by users. Seventy percent of Tango users call at least once a week and 60 percent of users place calls spontaneously, suggesting that Tango calls are becoming impromptu communications options for people, rather than a scheduled event. The majority of Tango users are between 18-44 with 65 percent male. Tango also said calls are about evenly split between Wi-Fi and 3G, while Android usage has now edged up to 55 percent of calls compared to the iPhone at 45 percent. Android represented only 20 percent of calls initially. 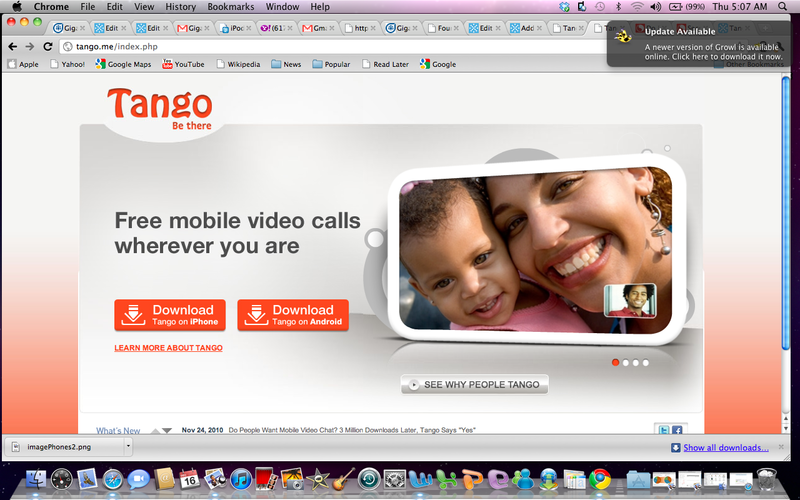 Tango’s growth is showing that mobile video chatting is becoming a viable way to communicate. And this is with a limited number of devices that can truly pull off two-way video chatting. As more Android devices and tablets like the Galaxy Tab sport more front-facing cameras, this should only grow. Tango’s success is due to its ability to operate cross platform and work over 3G and Wi-Fi. But it still faces plenty of competition. Fring, Qik, Yahoo (s yhoo) and Apple’s Facetime are all competitors, as is a new entrant OoVoo, which just showed off the ability to hold six-way mobile chats. And Skype is expected to get into the game at some point, which could scramble the competition. But Tango seems like it’s ready to compete. The company plans on expanding to other mobile platforms and sees itself ultimately on desktops, tablets and TVs. That should help video chat providers hit an estimated $1 billion in revenue by 2015, according to In-Stat. I thought Skype already provided face chat on mobile devices? Or am I just assuming? Face time is a great idea when we are looking good! But there are still many moments when I don’t need anyone else to see my face during face time and prefer to send an old fashioned text. There are moments in my life face time will come in handy which is with clients or long lost relatives. I see this as a addition to our texting but not replacing it. 4 million you say? As opposed to the 1 billion who send texts? Video calling is a fad until we get decent mobile networks. End of.